Connect ALL the things! 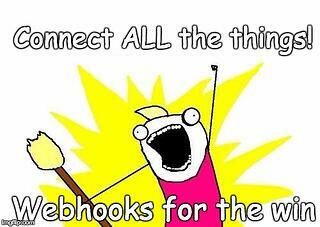 Webhooks for the win. Want to get a text message when your VM is provisioned? Want to have a Google doc updated anytime somebody provisions a new VM? Want to be silly and have your stereo play “Die, Die My Darling” every time one of your VMs is deleted? It’s easy with the power of WebHooks and CloudBolt! CloudBolt has always been able to be extended via our orchestration hooks and custom code. This gives an almost unlimited ability to integrate with external systems. This is (obviously) very powerful but that power comes with inherent complexity and requires some basic programming ability. One of the relatively new features in CloudBolt is the ability to tie CloudBolt Actions into arbitrary webhooks. This can be used to do all of the above examples and pretty much anything else you could think of… all so easily that even the pointy haired boss (otherwise known as me) can do it! So... if even the pointy haired boss can do it, you have no excuse not to! Please tell us about all the cool systems you've integrated into your CloudBolt ecosystem. We'd love to hear about it!